Create your very own superstar diva! Paint your nails with cool colors and fun designs! Hannah is a top model and wants to look amazing for her big photo shoot! Dress up this famous singer for all her fans! 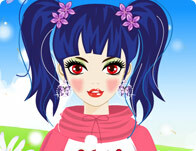 A fun cute makeover is just what this doll needs to help get rid of the winter blues! Make Britney Spears more beautiful, fashionable and cool with a new look!